Ependymomas of the spinal cord are glial tumors arising from ependymal cells along the central canal of the spinal cord. They are rare, typically have a long natural history, and behave differently than their intracranial counterparts. They are grouped based on the World Health Organization (WHO) classification from grade I to III, with grade II spinal cord ependymomas appearing to be the most indolent despite their intermediate grade. Myxopapillary ependymoma (MPE) is a distinct subset that occurs almost exclusively in the conus medullaris, cauda equina, or filum terminale. Spinal cord ependymomas often present insidiously with back pain or neurologic deficits that are dependent on their location within the cord. Management consists of surgical resection, with gross total resection (GTR) offering the best chance for long-term control and possible cure. 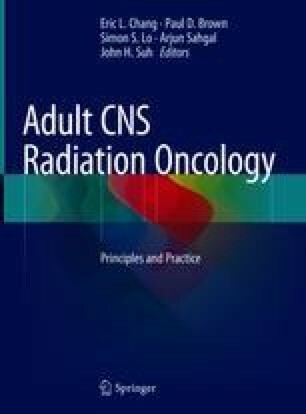 The role of postoperative radiation is controversial, but in general, radiation is employed locally for subtotal resection (STR), grade III (anaplastic) ependymomas, or after re-resection for recurrent disease. Long-term survival is excellent with rates over 85% at 10 years. However, 17 to 30% will recur, often years following initial treatment. As such, continued follow-up with surveillance imaging is essential.